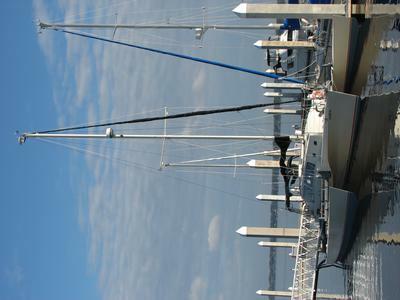 at NAS Naval Air Station marina Jacksonville Fla. 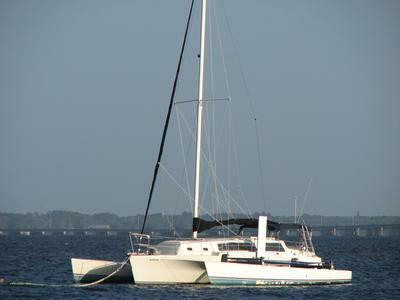 Designed by Glenn Henderson and built in 1992 by Hans Geissler of G-force and G-Cat catamaran fame, this G-Force High Tec 44' Trimaran is 44' long by 27' wide but will fold to 15'6" wide for trailering. The mast can be raised and lowered manually for clearing overhead bridges. She weighs in at 8,600 lbs to 11,000 lbs in original trim. New Yanmar YM30 fitted this spring will run out to 10 mph when clean. 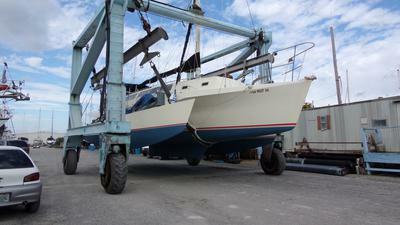 We sailed from Pompano beach loaded heavy, with a RIB and a 4KW Gen Set in Port AMAS, fully provisioned for 4 souls. We had 19 mph winds out of the east together with foot seas, and sailed north at over 14 mph, flat and smooth as could be. 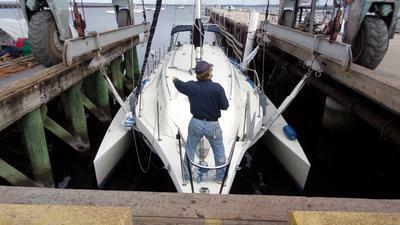 She's equipped with a new auto pilot and a 740S Plotter/Radar/Sounder. New window improvements, along with Davits for RIB to keep it off the tramps, can launch and retrieve dinghy on the move ....kind of cool! Lots of pictures on Facebook ...Ed Hileman Valdosta, Ga.